Not to be confused with Hospital, early examples of which were called dispensaries. The term also has Victorian antiquity, in 1862 the term dispensary was used in the folk song the Blaydon Races. The folk song differentiated the term dispensary from a Doctors surgery and an Infirmary. The advent of huge industrial plants in the late 19th and early 20th centuries, such as large steel mills, created a demand for in-house first responder services, including firefighting, emergency medical services, and even primary care that were closer to the point of need, under closer company control, and in many cases better capitalized than any services that the surrounding town could provide. In such contexts, company doctors and nurses were regularly on duty or on call. Electronic dispensaries are designed to ensure efficient and consistent dispensing of excipient and active ingredients in a secure data environment with full audit traceability. A standard dispensary system consists of a range of modules such as manual dispensing, supervisory, bulk dispensing, recipe management and interfacing with external systems. Such a system might dispense much more than just medical related products like alcohol, tobacco or vitamins and minerals. In Kenya, a dispensary is a small outpatient health facility, usually managed by a registered nurse. It provides the most basic primary healthcare services to rural communities, e.g. childhood immunization, family planning, wound dressing and management of common ailments like colds, diarrhea and simple malaria. The nurses report to the nursing officer at the health center, where they refer patients with complicated diseases to be managed by clinical officers. In India, a dispensary refers to a small setup with basic medical facilities where a doctor can provide a primary level of care. It doesn't have a hospitalization facility and is generally owned by single doctor. In remote areas of India where hospital facilities are not available, dispensaries will be available. 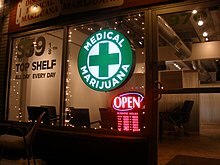 The term "dispensary" in the United States was used to refer to government agencies that sell alcoholic beverages, particularly in the state of Idaho and the South Carolina. In Arizona, British Columbia, California, Colorado, Connecticut, Illinois, Maine, Oregon, Michigan, New Jersey, New Mexico, New York, Rhode Island, Ontario, Quebec, and Washington (state), medical cannabis is sold in specially designated stores called cannabis dispensaries or "compassion clubs". These clubs are for members or patients only, unless legal cannabis has already passed in the state or province in question. In Canada dispensaries are far less abundant than in the USA; most Canadian dispensaries are in British Columbia and Ontario. in 2013 Uruguay became the first country to legalize marijuana cultivation, sale and consumption. The government is building a network of dispensaries that are meant to help to track marijuana sales and consumption. The move was meant to decrease the role of the criminal world in distribution and sales of it. ^ a b Engelbrecht, Gavin (7 June 2012). "Geordie anthem Blaydon Races landmark celebrated". thenorthernecho.co.uk. thenorthernecho.co.uk. Retrieved 6 October 2017. But them that had their noses broke they cam back ower hyem; Sum went to the Dispensary an’ uthers to Doctor Gibbs, An’ sum sought out the Infirmary to mend their broken ribs. ^ "List of Canadian dispensaries". Kingston Compassion. Archived from the original on 2012-06-11. ^ Carless, Will (2015-01-07) Uruguay's Year In Marijuana: 3 Successes, 3 Burning Questions. NBC News. Retrieved on 2015-12-17.